INDICATIONS: Our premier topical antifungal. Cures athlete’s foot (tinea pedis) and ringworm (tinea corporis). PHARMACOLOGY: Undecylenic Acid is a fungistatic agent employed in the treatment of tinea pedis, ringworm and dermatophytosis. Chloroxylenol is a topical antiseptic, germicide and antifungal agent effective against a wide variety of causative fungi and yeast organisms. Among those affected by Chloroxylenol are candida albicans, aspergillus niger, aspergillus flavus, trichophyton rubrum, trichophyton mentagrophytes, penicillum luteum and epidermophyton floccosum. The penetrating oil base vehicle serves as a delivery system, enhancing the impregnation of Undecylenic Acid and Chloroxylenol as antimicrobial agents. CONTRAINDICATIONS/WARNINGS: Gordochom is contraindicated in patients who are sensitive to Undecylenic Acid or Chloroxylenol. Not for ophthalmic or optic use. Avoid inhaling and contact with eyes or other mucous membranes. Not to be applied over blistered, raw or oozing areas of skin or over deep puncture wounds. For external use only. Keep out of reach of children. 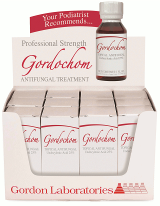 If a reaction suggesting sensitivity or chemical irritation should occur with the use of Gordochom, treatment should be discontinued. Use of Gordochom in pregnancy has not been established. Adverse Reactions: No significant adverse reactions have been reported. However attention should be paid to localized hypersensitivity. DIRECTIONS: Cleanse and dry affected areas. Apply a thin application twice a day (morning and night) to the affected area, or as recommended by your Physician. For athlete’s foot, pay special attention to the spaces between the toes; wear well-fitting ventilated shoes, and change shoes and socks at least once daily. For athlete’s foot and ringworm, use daily for 4 weeks. If condition persists longer, consult a Physician.